For the second time in less than a week, the Milwaukee Brewers have lost a key player to injury. Earlier this week, closer Corey Knebel went down with a hamstring injury that will keep him sidelined for four to six weeks. On Sunday, the Brewers placed Christian Yelich, a key offseason acquisition, on the 10-DL because of a strained oblique. The Brewers called up reliever Trevor Williams to take Yelich’s spot on the roster rather than bringing up a position player. Yelich hasn’t played since Wednesday. The Brewers were hopeful the issue would clear up in a few days and he could avoid the DL. An MRI came back clean, so the issue doesn’t appear to be serious. 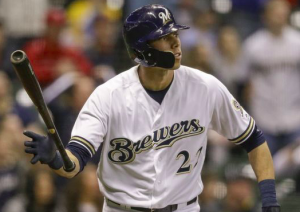 But with Yelich still experiencing discomfort and oblique injuries being notoriously tricky, Milwaukee finally decided on Sunday to put him on the DL. However, the Brewers remain optimistic that it will be a short stint on the DL. Yelich made sure to mention that going on the DL is a result of being cautious rather than him suffering a setback. Either way, his new team is sure to miss his presence. In the first six games of the season, Yelich hit .385 with a home run and five RBIs. In Milwaukee’s four games without Yelich in the lineup, the team has scored seven runs total and been shutout twice. Fortunately for the Brewers, they have a fair amount of depth in the outfield. His absence will allow Domingo Santana and Ryan Braun to play more regularly. Braun has started two games at first base this year as a way to get him and Santana in the lineup at the same time. The Brewers can also play Eric Thames in the outfield some days, with Jesus Aguilar deputizing at first base. Utility man Hernan Perez can also play the outfield if necessary. If he heels quickly, Yelich could be back as early as next Sunday. The Brewers are obviously optimistic that will be the case. But there are no guarantees when it comes to oblique injuries. While they have several possible replacements, for the time being, the Brewers will have to get by without arguably their best offensive player.